Coming off an 8-4 year in 2017, the Governors have been garnering attention from pollsters and college football publications all preseason. Last week, Austin Peay ranked No. 22 in the STATS FCS Media Poll, the first time the program had been featured in the rankings. Other notable publications have put the Govs in the Top 25 of their polls. 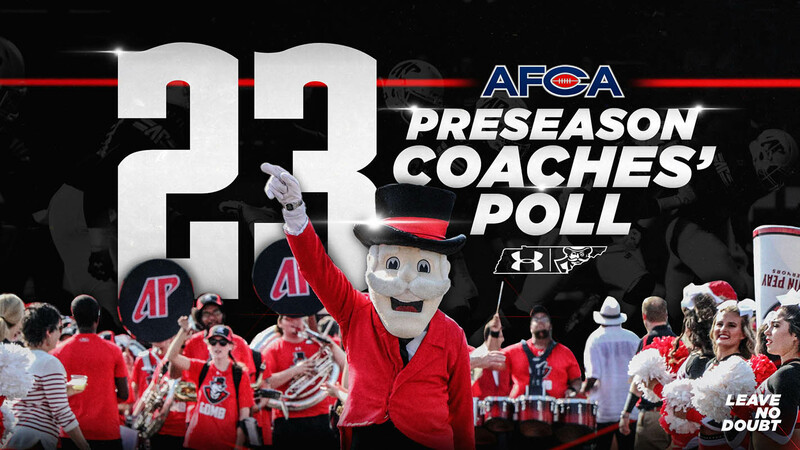 Lindy’s ranked Austin Peay 15th in its preseason poll, while Athlon and Street & Smith also had Austin Peay at No. 22. HERO Sports ranked the Govs No. 25 in its preseason poll. After an off day on Sunday, the Govs returned to the practice field Monday. They will hold practices beginning at 8:00am each weekday ahead of their second fall scrimmage, set for 2:30pm, Saturday at Fortera Stadium. Following the scrimmage, there will be a “Meet the Govs” event, presented by ECHO Power Engineering, hosted at Fortera Stadium where fans will be able to meet and greet the football, volleyball and soccer teams. More details about the event will be forthcoming on LetsGoPeay.com.